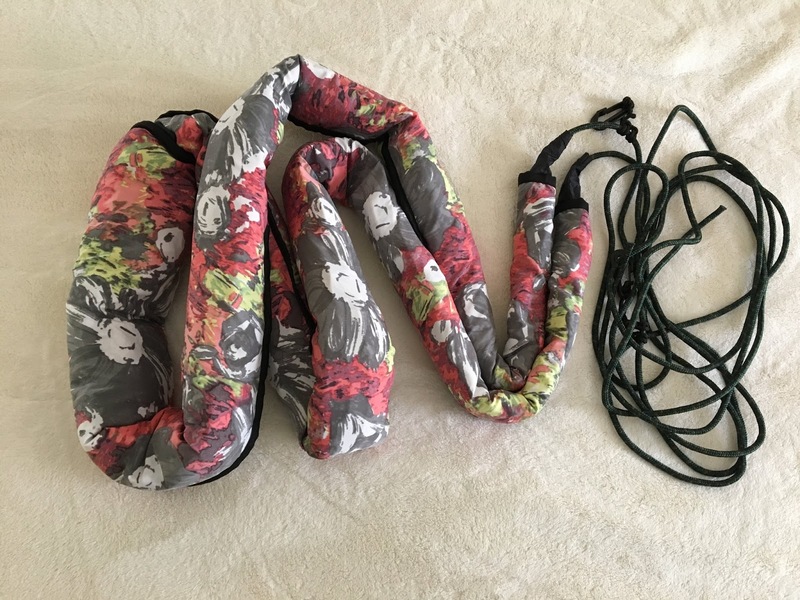 Have you heard of snake skins for hammocks? They’re simple and easy to make – I’ll show you how! 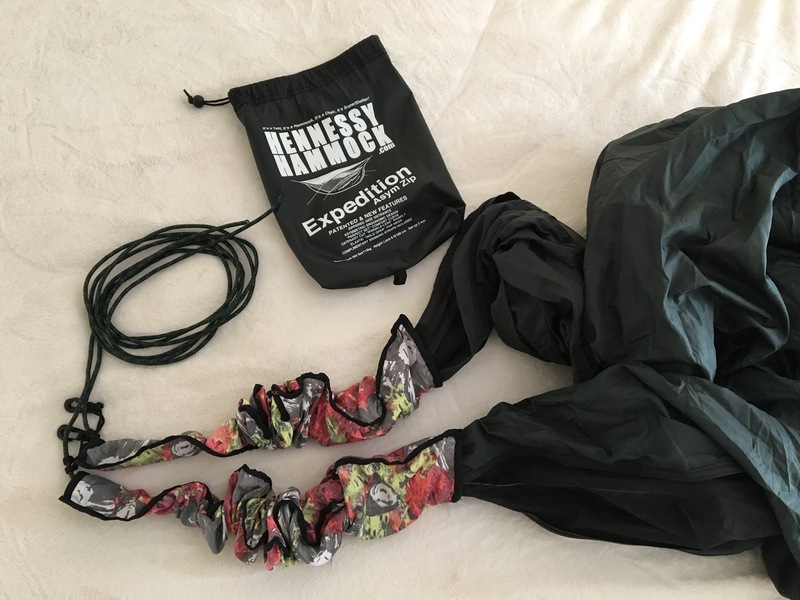 I got a great deal on a Hennessy Hammock system, and while watching YouTube videos about it someone mentioned you could buy Snake Skins (from Hennessy) to make setting up and packing your hammock easier. 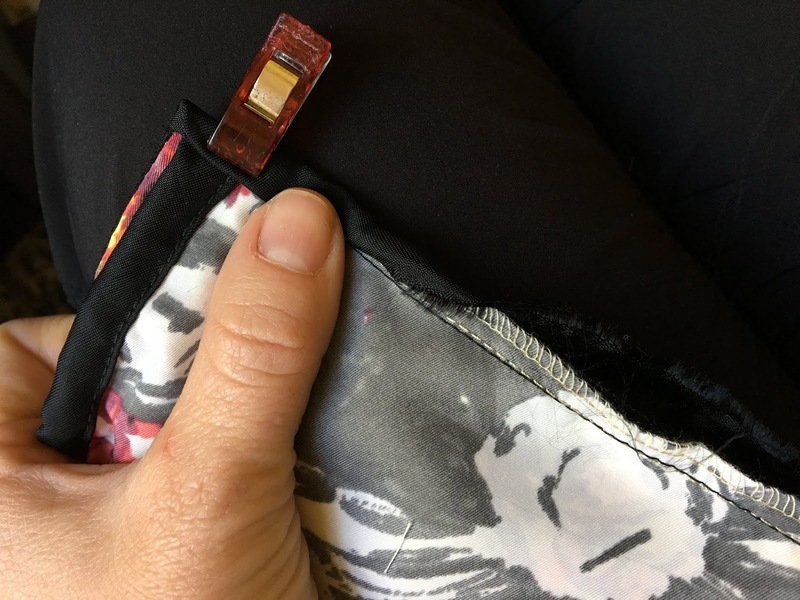 If it’s raining while you’re setting up they will keep things dry until you pull the skins back, and someone also mentioned if you’re in tick-prone areas the skins will keep ticks contained until you can open your gear and spray with permethrin. 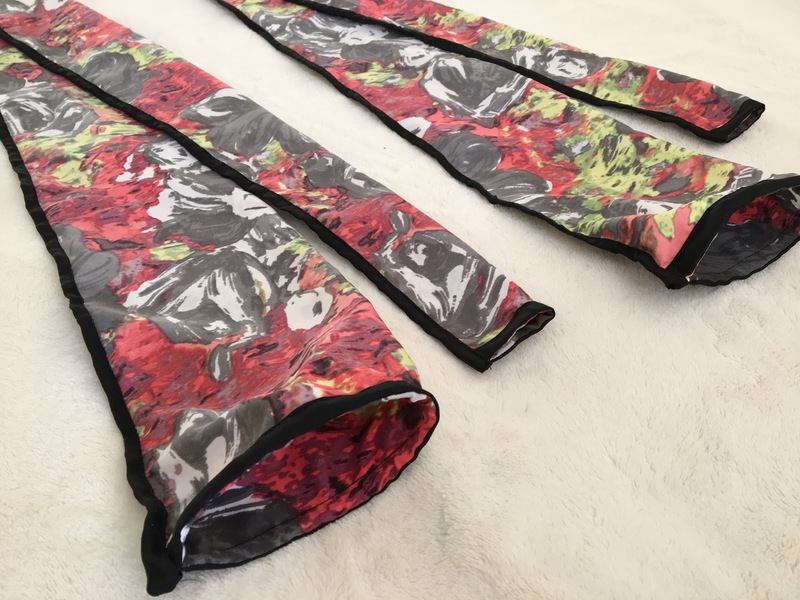 The skins are long sleeves that fit snug and are used in pairs. 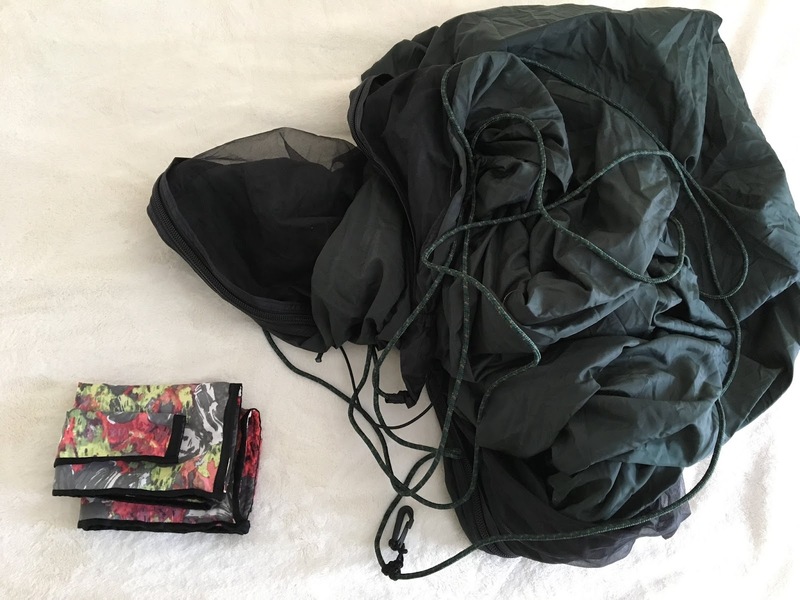 …with the skins the hammock is contained and easy to pack. 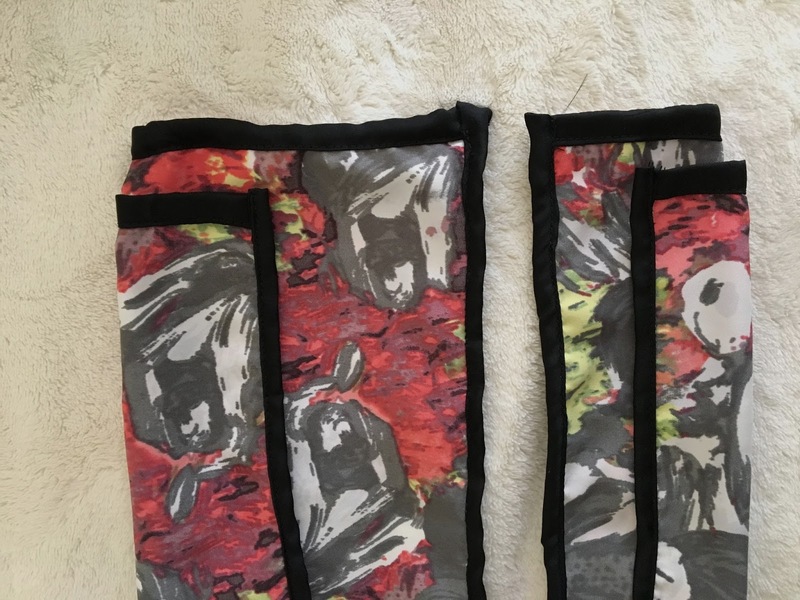 The hammock skins (left) are wider while the rainfly skins (right) are longer. 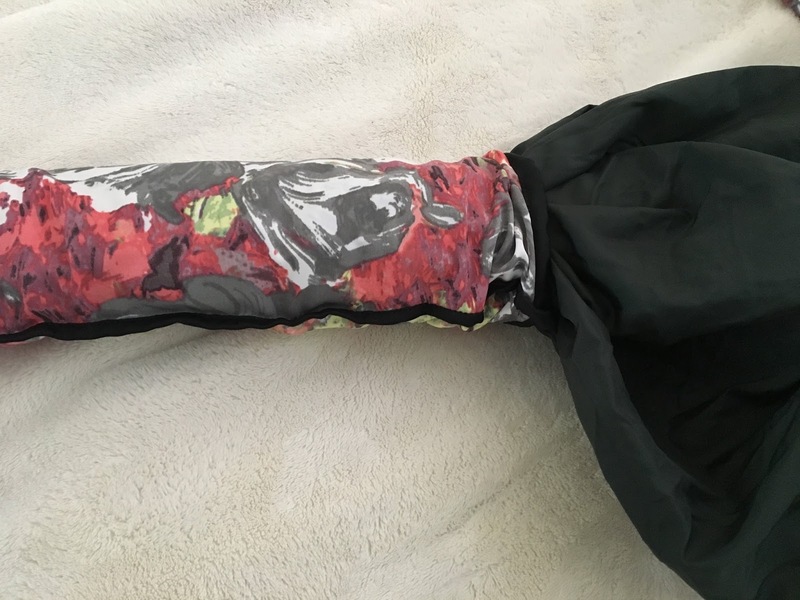 *The fabric I chose isn’t waterproof because I mostly wanted skins for the ease of packing and setting up. 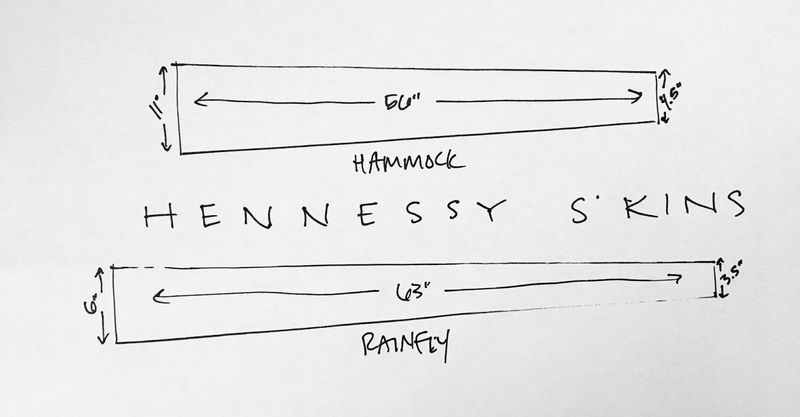 For the Hennessy Expedition Asym Zip system you can use the above dimensions to cut out your fabric for each item (x2). The skins overlap about 6″ in the center. 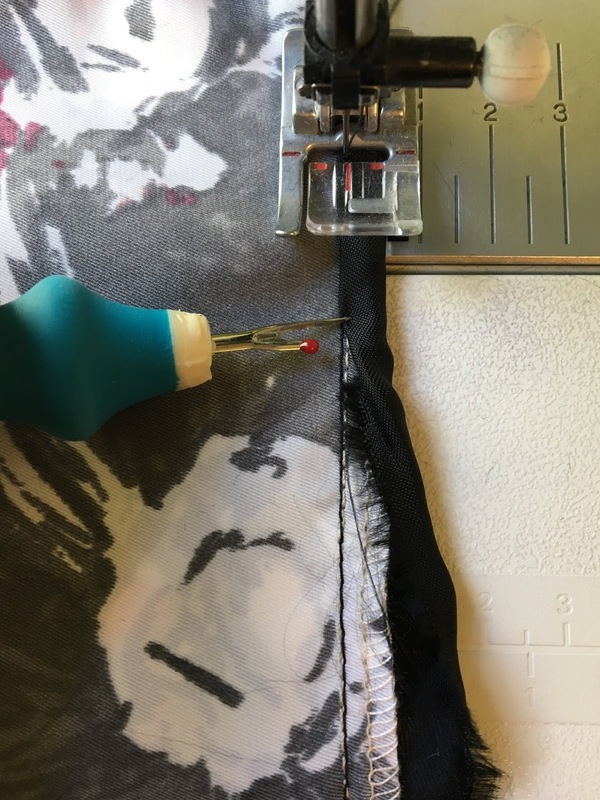 If you have a different system you can lay it out on the floor and measure the length you want your skins (plus any overlap in the center) and measure around your hammock/rainfly to see the girth for cutting the width. 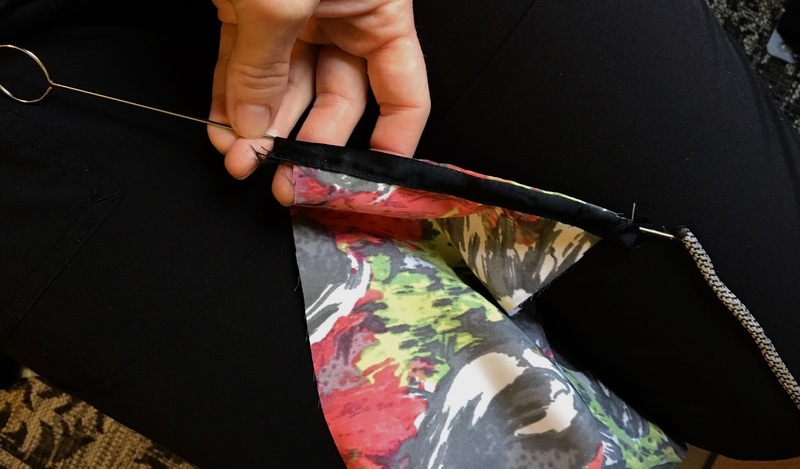 If your contrasting fabric rips easily, snip every inch and rip down the length. 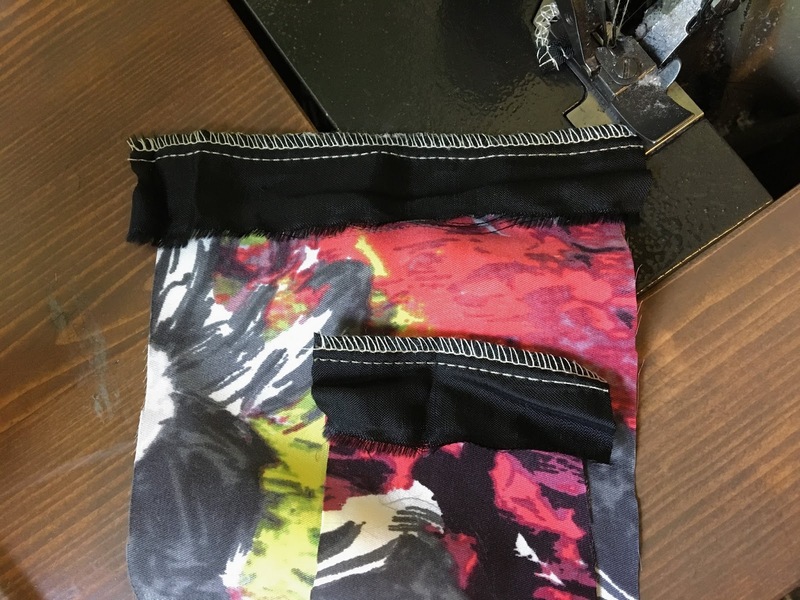 Make enough strips to cover both short ends and long end for each skin – sew strips together if necessary for proper length. 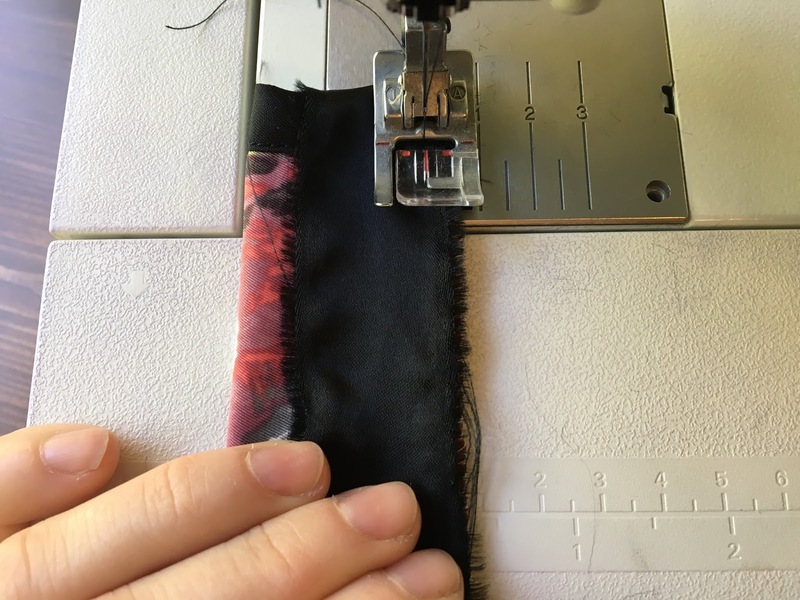 Sew the right-sides of your strips against the wrong-side of your fabric ends with a 1/4″ seam. 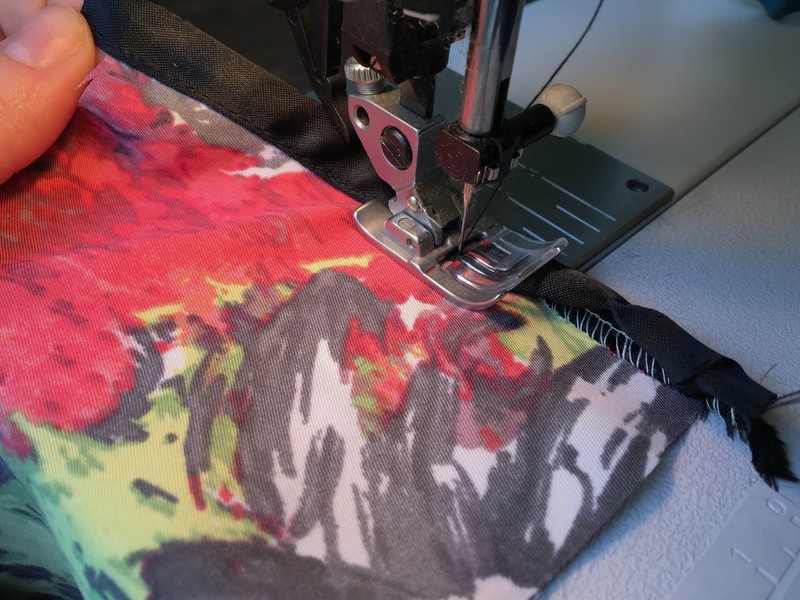 Use a serger if you have one. 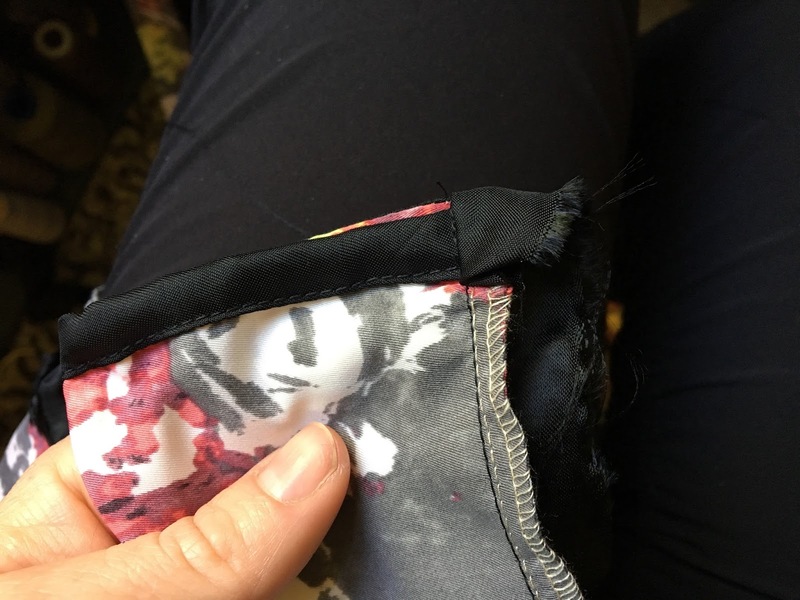 Turn the fabric over to the other side, turning the raw edge under to make a 3/8″ casing; topstitch close to edge. 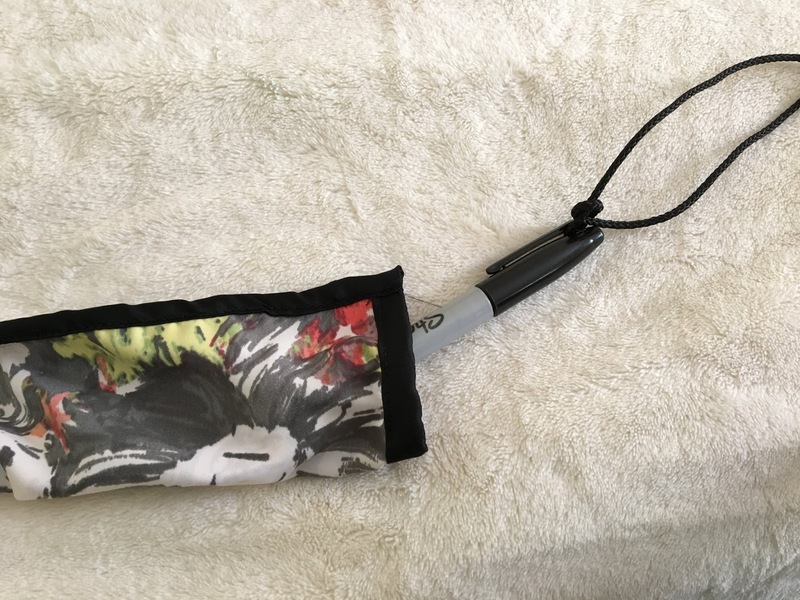 Use a tool to pull paracord through the widest end. 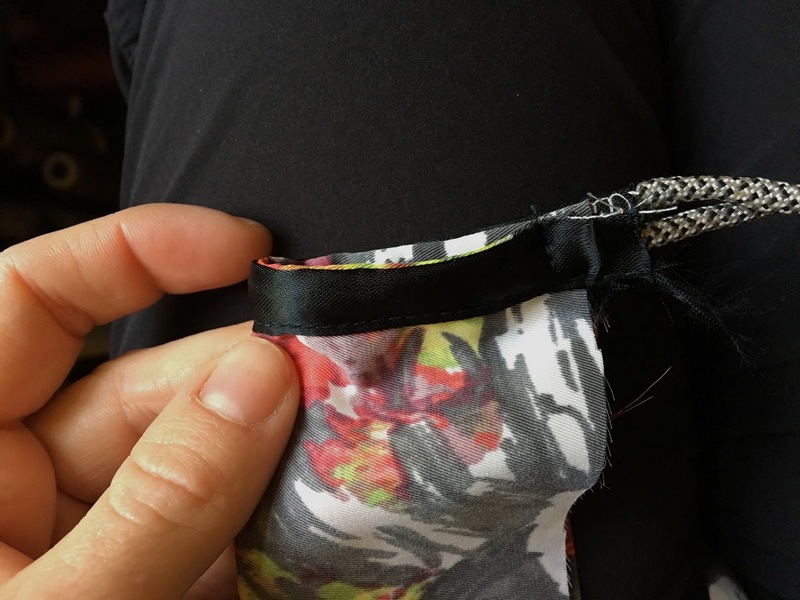 Fold fabric in-half with wrong-sides together and baste paracord in place close to raw edge. 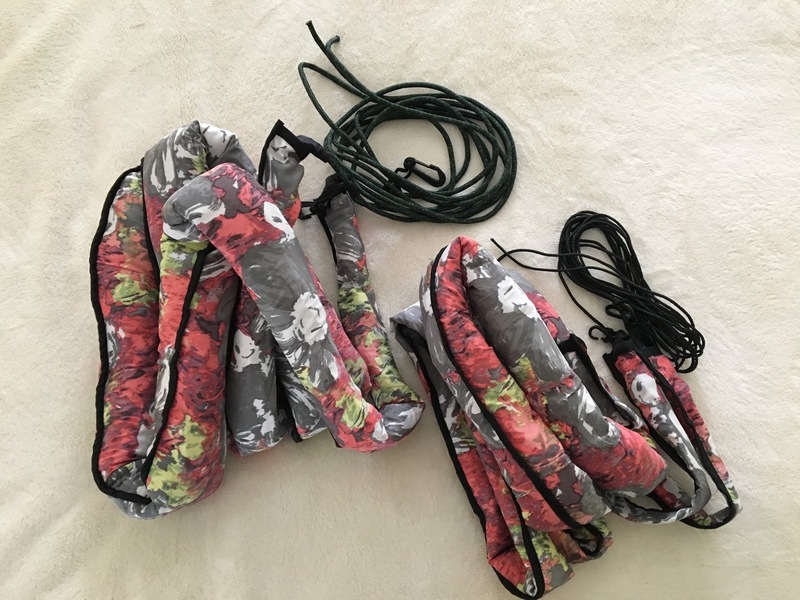 TIP: to reduce bulk, have paracord up high inside casing on one side and low on the other side so they’re sitting side-by-side once folded together. 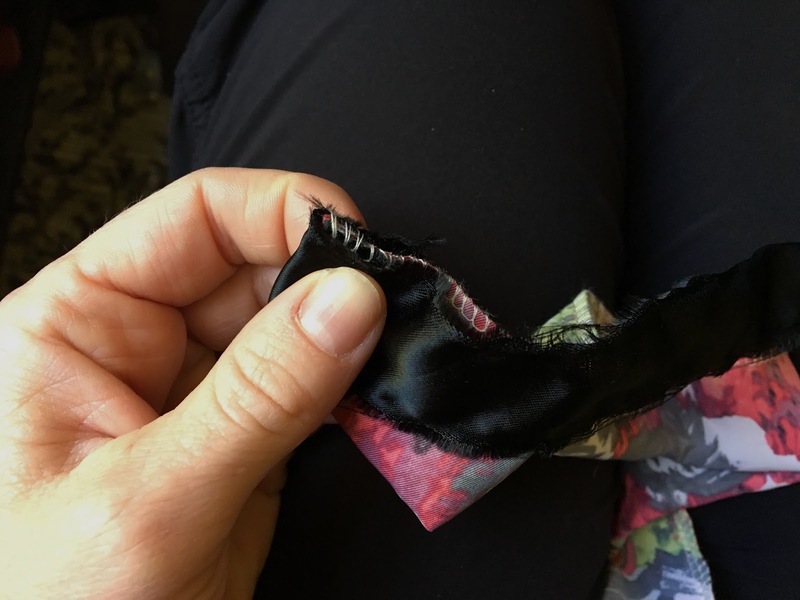 Continue to sew/serge down entire skin with raw edges together with a 1/4″ seam. 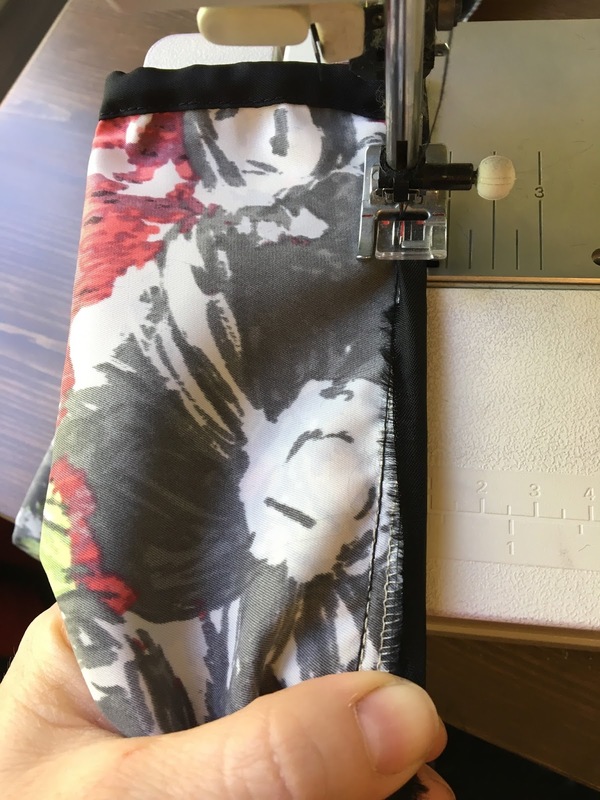 You will be sewing a strip along the long-raw edge to encase seam. 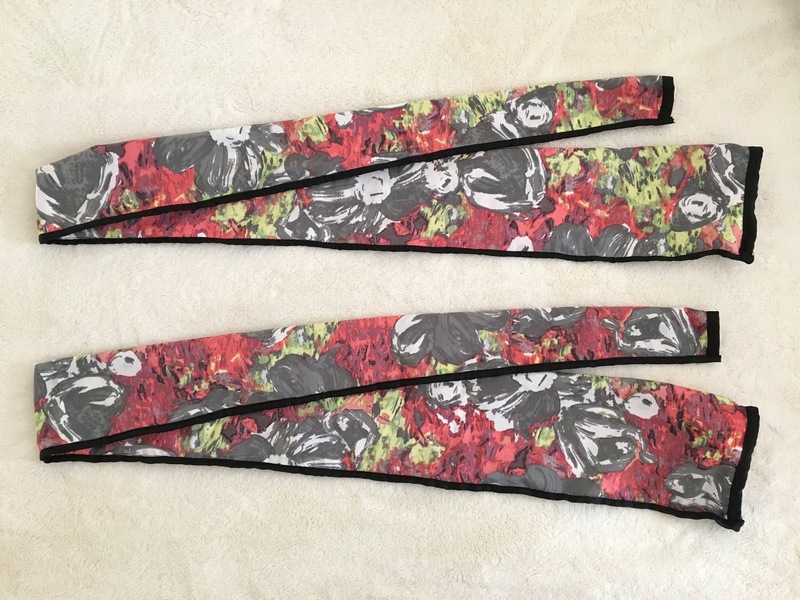 Have right-sides of skin and strip together, folding strip edge over the end to the other side (about 1/2″). 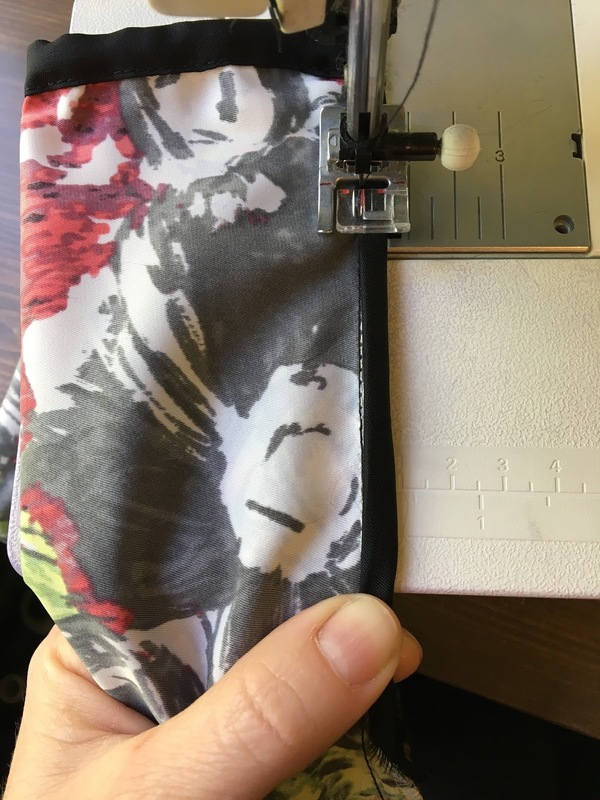 …as you near the other end, clip strip so it extends 1/2″ passed the edge and fold under to other side just as before. Backstitch. 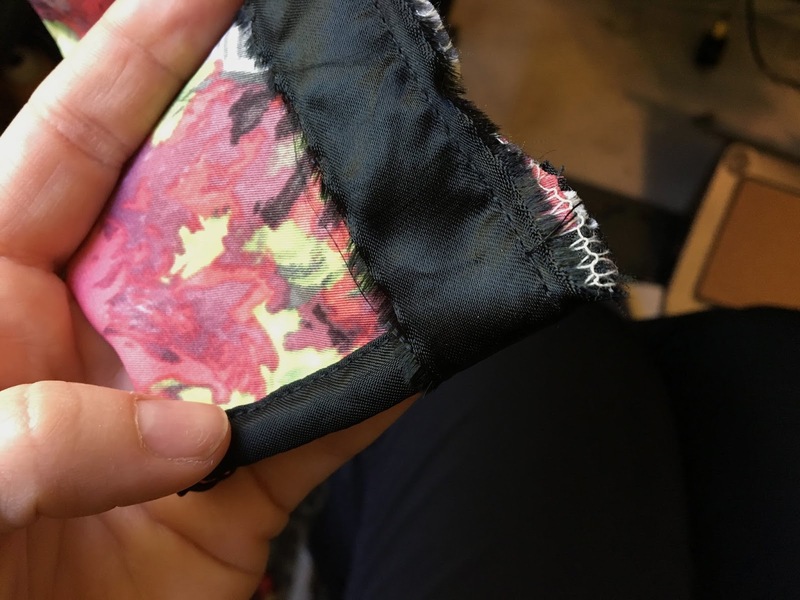 …and fold over to encase seam. 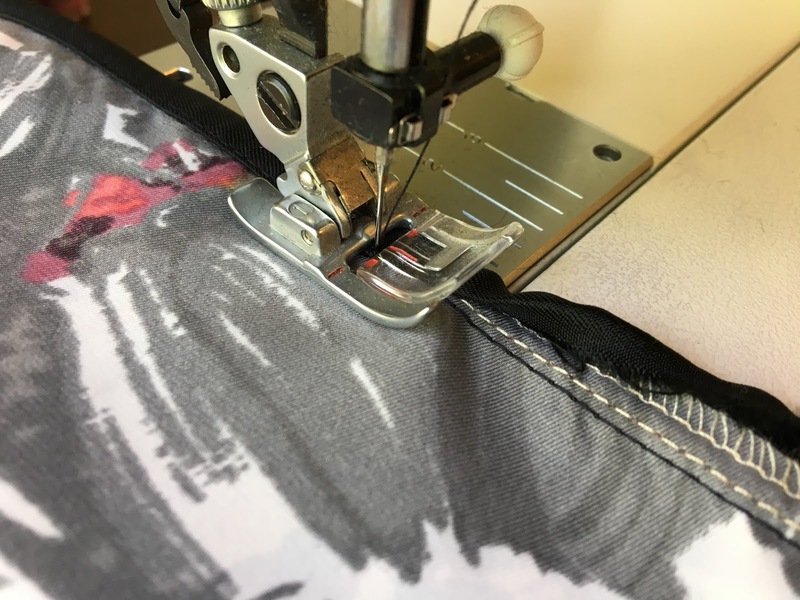 Once you get the end started under your machine – backstitch. …and fold again so the fold of the strip matches right along the stitch from the other side. Topstitch close to edge. Continue to the other end and backstitch. To pull strings through you can tie them around something and drop inside widest end of skin to the other side. The paracord inside the casing gives extra bulk to help pull the skin up. 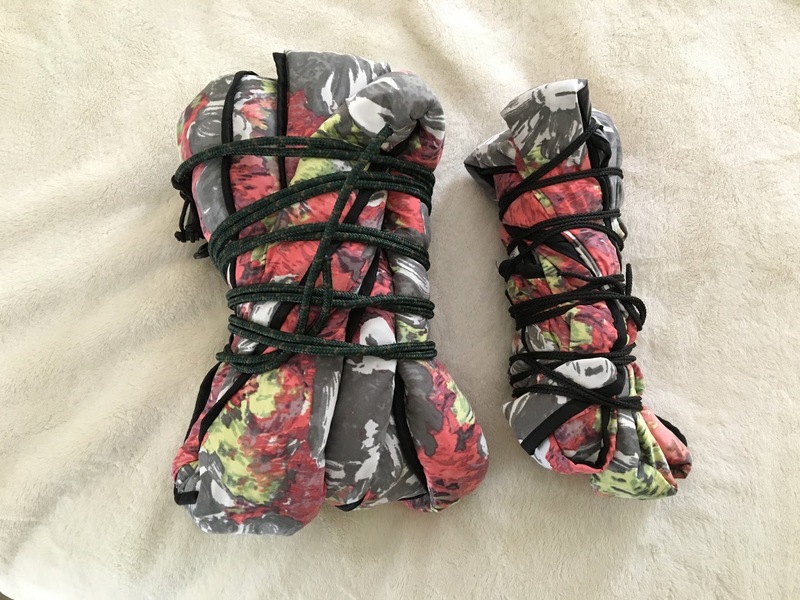 I’m not sure the best way to pack these yet, but for now I tied my ropes around each bundle and pushed into the sack. 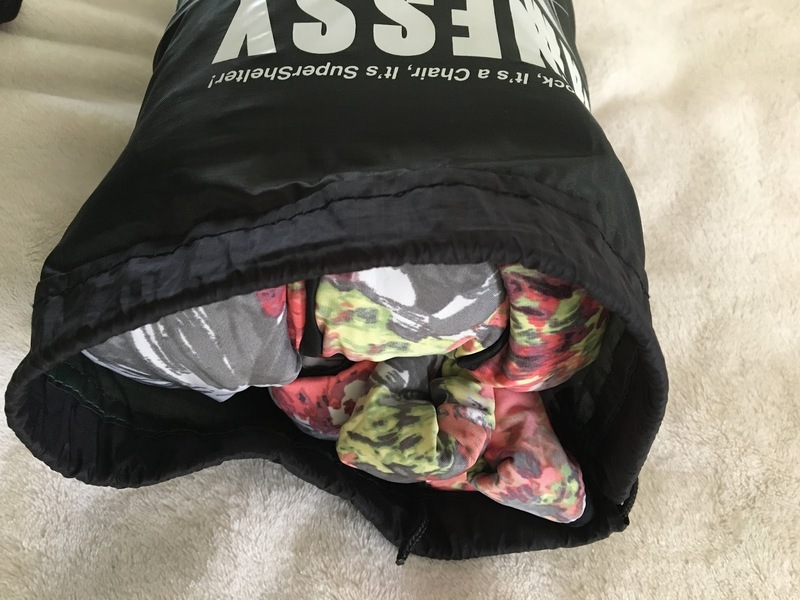 They pack into the bag easier with the skins – wahoo! I’ll have to update with some pictures from the trip my husband and I are going to take next week! Thanks for this! Do you have any other hammock or camping project instructions?